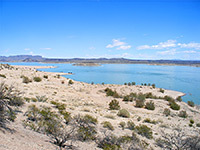 Seventeen of New Mexico's 35 state parks are based around an artificial lake, of which by far the largest is Elephant Butte, a 36,000 acre expanse formed by a concrete dam (completed 1916) across the Rio Grande, a few miles north of Truth Or Consequences and 80 miles from Las Cruces. The park contains 200 miles of shoreline and over 40 miles of the river valley, including a band of marshland several miles upstream of the lake's high water mark, extending almost as far as Bosque del Apache NWR, though most visitor activities are concentrated in a five mile section along the southwest shore, and include the usual marinas, boat launch ramps, campsites, picnic areas and beaches. Elephant Butte Lake is one of the most visited state parks in New Mexico, popular because of the abundant water recreation and the easy access, just a few miles from interstate 25; it is not noted for hiking or scenery, however, being enclosed by low, sandy hills and occasional outcrops of dull limestone, and lacking any extended trails. Instead, fishing, water skiing, houseboating, canoeing, scuba diving, swimming and camping are the main pursuits. The surface elevation (when full) is 4,414 feet, and the surroundings are quite arid and barren - this part of the Rio Grande valley forms the northernmost tip of the great Chihuahuan Desert so summer temperatures are high, and the vegetation includes several types of cactus. The lake itself is named after a strangely-shaped remnant of an ancient volcano, now forming an island just opposite the dam. The visitor center and state park headquarters are reached by roads 179 and 195; near the junction, a spur road leads to facilities including a launch ramp near Marina Del Sur, and to a number of picnic areas and overlooks. A $5 fee (2019) is collected for day use. The scenery hereabouts is typical of the whole lake - earthen hills sloping quite gently down to the water, sparsely covered with straggly bushes and cacti, many small bays and inlets, several islands, and a higher range of hills along the inaccessible east side of the reservoir. 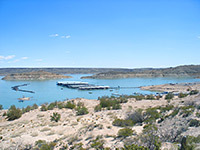 The main shoreline access is a little further north, via Rock Canyon Drive, forking off Hwy 195 in the middle of Elephant Butte, a small village offering all kinds of boat-related businesses. This paved road follows close to the water's edge for 8 miles before turning inland and meeting I-25 at exit 89. En route are many side roads, some paved with facilities and self-pay fee stations, others unpaved and free to enter. Half way along is the residential area of Highlands, while for RVs, the place to stay is the campground on South Monticello Point - a treeless promontory that has fine views over much of the lake. The campground contains 50 electric/water RV sites and is near a boat launch ramp. Tent camping is also available at three other locations further south (Desert Cove, Lion's Beach, Quail Run). Beyond Rock Canyon Road, several other parts of the west side of the lake are reachable by unpaved tracks starting from I-25, though the waterway is quite narrow and shallow in this region. A few miles south of the lake, Truth Or Consequences has a small selection of hotels.